The amount of calculations CPUs can handle in a second gets better every year with each new generation of processors. However, developers then use any unused additional processing power to create enhancements to their plugins without leaving extra for the DAW. Therefore, we never get ahead of the problem. What can you do if your computer isn't able to do all the processing, but you still need to deliver a finished song? Part of the problem is that our CPUs have to calculate the signal processing in real-time which means that there isn’t a lot of time to finish calculations and at some point, the CPU can’t keep up with that causing artifacts and dropouts. When producing or mixing a song, the solution to the problem and the only way of doing things especially on slower computers is to bounce or render virtual instruments and MIDI files to make them permanent, ultimately creating an audio file which relieves the CPU from having to calculate the same thing over and over again in real-time. Rendering virtual instrument tracks and audio tracks which have plugins on them is considered a best practice especially when you want to be able to recall a project in the future. When a DAW company changes which plugin versions they support you can run into this issue, especially when the plugin software provider either goes out of business, discontinues their product or doesn't update its format to keep up with the ever-evolving industry. An Operating System update can also cause this. An obvious way of getting more processing power out of your CPU is to merely increase the buffer size of your audio interface to the max, but if you are in the middle of creating something from scratch, this is not an option because it is impossible to play any instrument without latency issues if your buffer size is set to above 128 samples. If you are in the final stages and ready to mix your song, you can quickly increase the latency to the maximum possible buffer size. 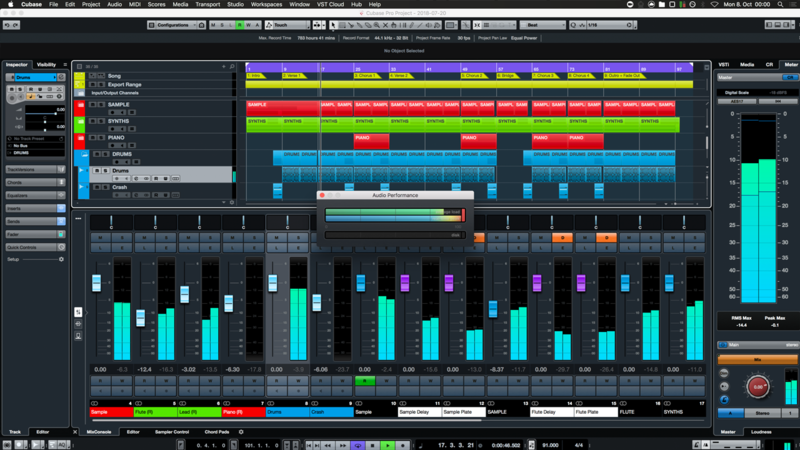 To address this issue, Cubase introduced a new feature which is called "ASIO-Guard". This feature comes with 3 settings: low, normal, and high. 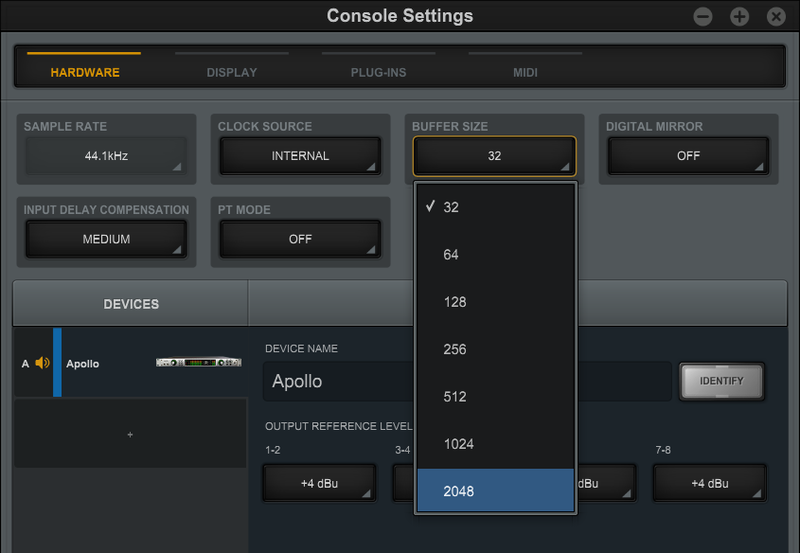 Each setting will give you an increase in how many plugins you can run simultaneously. When using this setting on "high" your computer will allow you to maximize the number of plugins you can run. In some instances increasing the buffer size isn't an option, per example if you are recording audio or a virtual instrument. Using lots of Plugins and Virtual Instruments When Producing or Mixing? The oldest way of doing this is to click the MIDI part in the Project Window, press the letter P on your keyboard, which then the sets your left and right locators to mark the section you want to export. After that, you will need to go to the menu bar and choose "File - Export - Audio Mixdown". We also can use the "Channel Batch Export" checkbox in the top left corner of that window to do multiple instruments at once. However, when using this technique be aware that it will also capture any insert effects, EQ, or channel strips which have been activated. If you don't want to include this in your export, make sure you disable them first. Even before "Render in Place" was available as a feature in Cubase, you were able to freeze an instrument track which allowed you to free up processing power during playback. 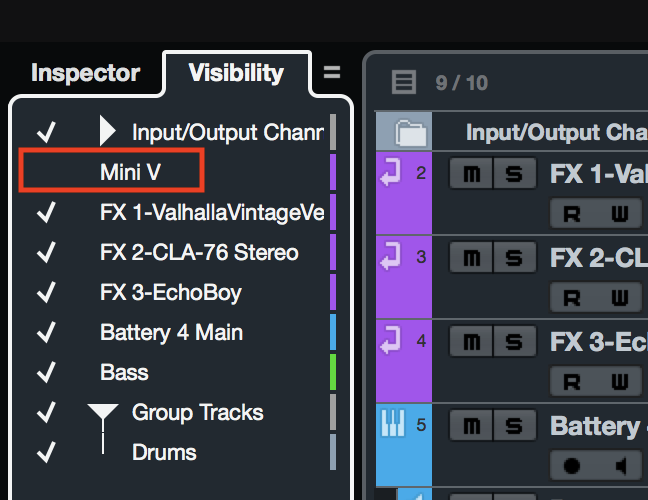 This feature renders your MIDI part on your instrument track and creates an audio file of it. The audio file then automatically gets saved in a new folder called "Freeze" inside your project folder. It will use this file for playback and the instrument itself gets locked. There are multiple ways of freezing an instrument track. The easiest way is to select your instrument in the tracklist and go to the left zone in your Project Window and click on the Inspector tab. There you will find the "Freeze Instrument Channel" button in the bottom right section right below the instrument's name. 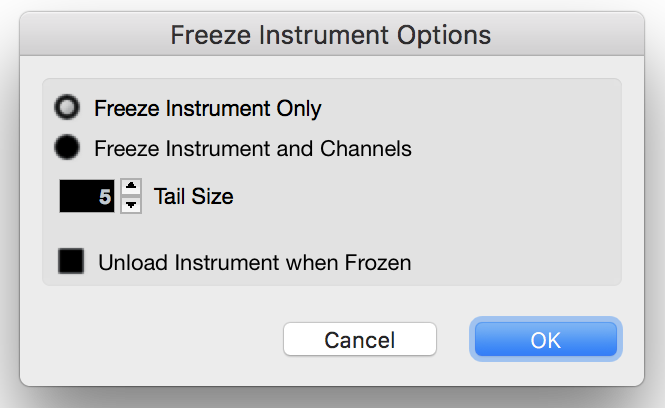 In the "Freeze Instrument Options" window you can choose between two options. You either choose "Freeze Instrument Only" which allows you to add Insert effects after freezing on the frozen instrument track, or you can choose to "Freeze Instrument and Channels" which will also render your insert effect plugins. Note, that after doing this all insert effects get disabled so you can't change any of the plugin settings anymore unless you first unfreeze the instrument track. When freezing your instrument you also can set the "Tail Size" time (seconds) which allows you to choose a value which will add a tail to your audio file. That ensures that your instrument doesn't get cut off too early which can be very important for pad sounds or instruments that have a long built-in reverb. The "Unload Instrument when Frozen" feature is recommended if you are using samplers which load vast amounts of data into your RAM (for example Kontakt, Session Strings, sampled orchestral libraries). Activating this will free up your computer's RAM which will be quite significant especially if you don't have abundant amounts of RAM available. After freezing your track the instrument controls will be locked so you won't be able to change any parameter. In order to change parameters, you will need to unfreeze the instrument first. To get a visual feedback that an instrument is frozen the Inspector shows the "Freeze Instrument Channel" button in orange and the Instrument name will also change its color to orange. In your MixConsole, it then shows a star above the channel name. A more flexible way of doing this is using the "Render in place" dialog window which can be found in the menu under "Edit - Render in Place". There are alternate ways to open this menu holding down any "modifier key while right-clicking" (an example of modifier keys: Ctrl, Shift, Alt/Option, Cmd) on the project window to open the context menu or assigning custom key commands. 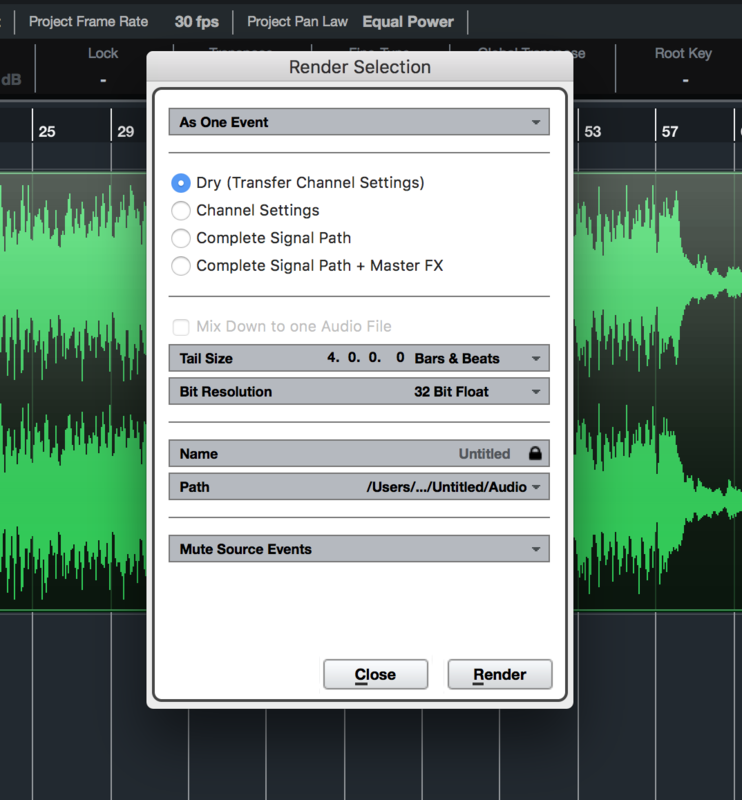 The main advantage of using render in place in comparison to just exporting the instrument track is that it gives you additional options like exporting the instrument "dry" which doesn’t include any plugins on inserts, send effects, EQ, channel strip settings, fader settings or routing paths into the file. However, when the new file has finished rendering, all your settings will be copied over to the new audio channel ensuring that everything sounds exactly the same. This will help to reduce CPU usage which would have been wasted to calculate the instrument in real-time. This helps especially for some power hungry instruments and this can improve your computer's performance quite a bit allowing you to run more effects during mixing. The other 3 options ("General Settings", "Complete Signal Path", "Complete Signal Path + Master FX") allow you to render more of the signal path depending on what setting you need. I don't want to bore you with the exact details, but if you are interested, I would recommend for you to read about "Render Tracks" in the Cubase Help Manual. Another great feature of the "Render Selection Dialog Window" is that you can change the "Tail Size" and adjust it using "Seconds" or "Beats & Bars" to ensure that your instrument tail doesn't get cut off too early when rendering. By default, this setting is set to "Off" which might sound weird especially at the end of the song. It might be best to include a tail at the end of each part you render which you can then trim to your liking. Another step, which is essential to mention, is that in order to actually save CPU power you have to disable the instrument track manually after rendering it. The "Render Selection" window only allows you to "Mute Source Events" but that usually only mutes your MIDI part and the instrument might still be using your CPU in the background, especially if the instrument isn't a VST 3 plugin. The best way to disable your instrument track is to select it in the tracklist, right click on it, and select "Disable Track". Additionally, to keep perfectly organized, I would recommend hiding the instrument track so it doesn't take up space in your project window. To do so make sure your "Left Zone" is visible first, click on the "Visibility" tab and uncheck the checkmark next to your instrument name. 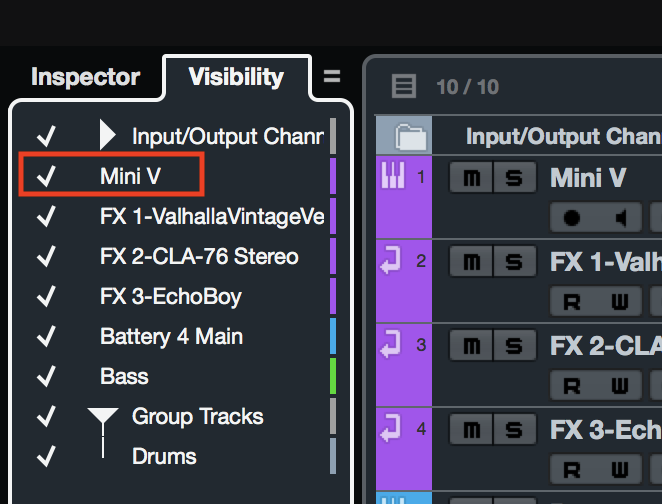 If you need to change a setting on your instrument for any reason later on you can just set the checkmark for that track in the "Visibility" tab for your instrument track. This will make the instrument track visible again in your track list. You then can right click it and choose "Enable Track". Cubase 9.5 also introduced a new feature which is called "Direct Offline Processing" that lets you apply plugin effects to either only a small part of a single audio file or multiple audio files at once. When using this technique Cubase will update and create new versions of audio file(s) in the background which get saved in the "Edits" folder for your project. This process is non-destructive which means it won't change your original audio file(s). To open the Direct Offline Processing tool all you need to do is to select an audio event and press F7. In the Direct Offline Processing window, you can then add plugins as usual. The difference here is that the processing will only be done once in the background instead of having your CPU continually doing all the calculations in real-time during playback. Direct Offline Processing renders a new audio file in the background which allows Cubase playback the rendered audio file saving CPU processing power. Even after applying the settings in this feature, you can always change them, rearrange the order of the plugins or add new ones. Depending on the performance of the computer and the length of the plugin chain this all might happen without you even noticing, but older computers might take a couple of seconds until the file is rendered. Typically this will work seamlessly. In addition to that, it is also possible to quickly render multiple clips at once with the same plugin. A typical example for using this would be to run all your drum channels through the same tape machine plugin. Similar to the render in place function you can also add tails to make sure your favorite reverb plugin doesn't get cut off too soon. Cubase's Direct Offline Processing feature needs to have a couple of enhancements to make it more efficient and usable. Currently, it is not possible to save or recall your favorite plugin chain which forces you to always start from scratch when using this tool. This can be very annoying if you have to do the same thing over and over again. Another thing which would be very helpful is the ability to use a button which allows you to transfer the existing MixConsole plugin effects chain inside the Direct Offline Processing window. Also using "cmd + C" on Mac or "Ctrl + C" on PC to copy and "cmd + V" on Mac or "Ctrl + V" on PC to paste plugin chains from one event to the next would be very helpful. Hopefully, I was able to give you a couple of ideas how you can make use of Cubase's features to get the most out of your production. No matter how new and powerful your computer is you can always run out of processing power but using some of the tips and tricks I showed will help you optimize your workflow. Please post any questions or suggestions for future topics in the Cubase User Group.